Come with us on this nostalgic journey to the ancient City of Chester to relive the halcyon days of the Guy Arab. The Chester Corporation bus fleet had a post war fleet of 47 Guy Arabs. Fortunately a number have survived in to preservation. One such vehicle is 35 (FFM 135C), a Guy Arab V with Massey H73F bodywork dating from 1965. 35 now resides at the North West Museum of Road Transport in St. Helens, Merseyside. Our cameras spent the day with 35 in November 2008. We joined her at the Museum for the run down to Chester. Once in Chester, at City Road by the railway station and not far from the depot 35 lived for it’s entire operating life, we set to recreating some of the routes 35 would have been seen operating on. Our first location is the ‘Trooper Inn’ on Whitchurch Road, the former terminus of route number 5. From here we journey to the pretty village of Christleton and on into Chester to the famous Northgate entrance to the city. We continue our journey through the Bus Exchange to Handbridge which takes us through the Bridgegate and over the Old Dee bridge, an area so familiar with these buses. From Bridge Street we enter the city again and film 35 in Foregate Street with the Eastgate clock as a backdrop. We then return to City Road before the run back to 35’s new home in St. Helens. A truly nostalgic journey for you to enjoy! 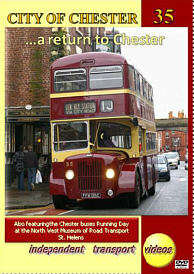 The second part of this programme records the Chester buses Running Day held at the St. Helens Museum in April 2008. Here we encounter a number of former Chester buses in action, No.1 (RFM 641) from 1953, and the very last Guy Arab built for the home market, No.47 (DFM 347H). 35 is there on her first day out after repainting as well as two surprises! Massey bodied Leyland Tiger Cub 53 (RFM 453F) and blue liveried 80 (TMB 880R) the Duple bodied Leyland Leopard with dual purpose seats. Former Leyland Olympian 10 (F210 JMB) visits as well as Fleetline 79 (BCB 613V). So enjoy the action and take a few rides with us on these superb former Chester buses. Duration : 100 minutes (approx).